Let’s put all the Amazon niche talk into practice and see exactly what works and how effective every tactic out there actually is. 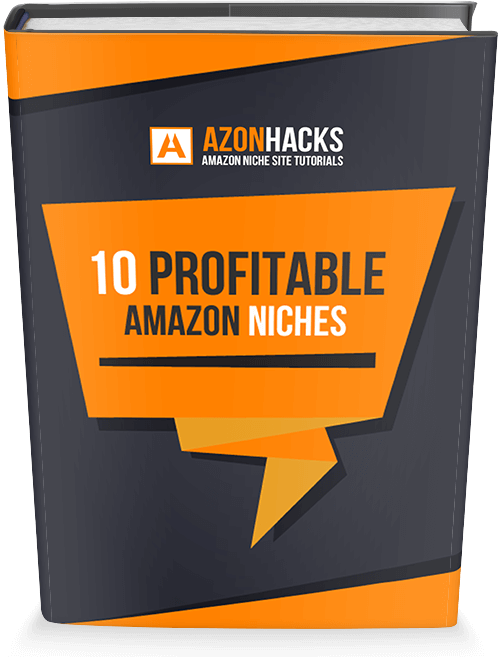 I’ll put two Amazon niche sites against each other and write my progress on AzonHacks. Follow my Amazon affiliate journey here. I’m so happy and so excited to announce this Amazon niche site experiment duel and share all the tactics and results publicly with all of you. Basically, I’m gonna create two different Amazon niche sites in two different niches and try to rank them with different SEO tactics. Note: Each niche was discovered and decided on by following the guidelines from my niche validation and keyword research article. All search volumes were tested by KWFinder, and actually, one niche was found by accident just by using KWFinder. The goal of this experiment is to achieve good Google rankings and make at least $1000/mo as fast as possible. I won’t show off and put some flashy goals to impress you, I just wanna make any money within the first 3 months, even if that means just crappy 1 sale. The first $500/mo should be achievable within 6 months and finally $1000/mo within 12 months of starting this experiment, but hopefully a lot sooner. Maybe just one website will reach these goals in given time, maybe both of them will, and maybe both of them will fail. That’s exactly why I am doing this, to see what works, so that you also know what to do with your sites. My only wish from all this is to encourage you to start your Azon journey as soon as possible and to show you that it can really be done if you are persistent and if you work hard. I really wanted to make this interesting and exciting, so I got this crazy idea of making two Amazon niche sites and ranking and building them in completely opposite ways (well, almost). One niche site will be made with minimum expenses, and the other one will be outsourced as much as possible. In other words, with one site I want to show you that you can do it even if you have no money at all (or very little for just basic costs), and with another site I want to show you how you can save time and outsource all the boring tasks until you start making enough money to cover all that initial investment and later just enjoy your profits. To show you what I mean here’s a little table with some more details. Exact details about all tools used and everything else will be mentioned in my progress reports. Also, a more updated table will be shown on a separate page about this experiment which will be linked from the main menu and this article as soon as I make it. Niche A is a fun hobby niche I find very interesting. It’s something we have all probably done at some point in our lives, but for some people, it’s not just a hobby, it’s a passion. And that’s why I like it so much. Since it’s fun and I know at least the basics of it I decided to pick Niche A as a niche where I will personally write content. Hopefully, that will make my life easier. This niche website is going to be special because everything used on it will be free – free WordPress theme, free plugins and all content will be written by me or gotten otherwise for free (for example through interviews, guest posts, expert roundups and similar). Also, this niche site A will have latest articles on the home page, where niche site B will have one big article shown on its home page. Another special point for niche A is the SEO tactics I’ll be using. Everything done will be strictly white-hat SEO. Now, I know it’s hard to define what’s white-hat SEO nowadays because Google doesn’t want us to build any kind of links manually, but let’s just say I won’t be using any shady black-hat tactics like PBN links, paid web 2.0 links, paid social signals or anything else considered black-hat. Every SEO thing I do will also be free, and I won’t even use any kind of paid advertising. The only expense for this website will be hosting and a domain name. That’s like the minimum investment you need to have. You can obviously find some free web hosting companies out there but I don’t want that to have a negative effect on my niche sites and this experiment. Both niche A and niche B will be hosted on Green Geeks hosting, on the same server. If you get your hosting with GreenGeeks you’ll also get a free domain, which is cool. I’m sure you would also like to know what’s the search volume for this niche, together with SEO difficulty (KC), so let me show you. The image above (screenshot from KWFinder) is the main reason I’ve chosen this particular niche. The search volume is not that great, only 1000 visitors per month, but since KC is really low it should be easy enough to rank and start getting some sales quickly. Another reason why I’ve picked this niche are the other sub-niches very similar to this one. I’ll use that to build some sort of authority website which will cover all those sub-niche, while my main focus will be on this particular niche, at least at the beginning. Prices for products in niche A range from $30 to $130 in most cases, although there are some good products costing $200 and more. That should bring some okayish commissions, we’ll see soon enough. I have a lot of hopes for this niche and can’t wait to create the website and to publish first articles. I think it’s something that will truly be of great value for readers and since it’s Christmas very soon who knows, maybe I’ll strike a few sales even this year. Niche B is another fun niche and something that most of us have tried at some point in our lives. The product itself which is being used for this niche is not something I’m very familiar with, that’s why I decided to outsource all the writing for it. Not just that, everything is this niche will be outsourced and premium (paid). The WordPress theme, most plugins, writing articles and all SEO tactics. Basically, I want to put everything on autopilot for Niche B, I’ll just manage it and make decisions for certain things, but all hard work will be done by someone else (outsourced). The reason why I chose this niche is its high search volume and expensive products. As you can see niche B is a lot harder, SEO wise, than niche A. It’s still considered easy to rank but I assure you, there are some respectful competitors I’ll be fighting with. But the search volume is awesome. It’s an average of 3500 throughout the year, where November and December go a lot higher, about 8000 to 12000 searches per month. The rest of the year it’s around 2000 searches which is also very good. The pricing for this particular product is great, it ranges from $100 up to $300. All that combined this should be a good money maker. Now, since there’s some nice SEO competition I need to beat I decided to do a bit of cheating and use all those dirty black-hat SEO tactics known to mankind. Mostly that will be PBN links. Since I don’t have time (nor wish) to create my own PBNs I’ll just buy the links from other people. Everything else, any kind of backlinks or social backlinks will be outsourced and paid for as well. My homepage for niche B will be one big article showing off the best products. This niche isn’t something I can really expand to other sub-niches, that’s why it’s going to be more of a small niche website and not an authority kind of website, like what I plan with niche A. As with niche A, niche B will also be hosted on Green Geeks, on the same server as niche A.
I’m really going all-in with this niche, I’ll do my best to rank it ASAP and to start making money as soon as possible. I’ll be careful and try not to create any suspicion from Google and hopefully avoid getting a Google penalty. If that works this niche is going to become my personal Amazon ATM machine! AzonHacks is meant to be a learning hub for all you interested in making money with Amazon affiliate program. For that reason, I must write tutorials and teach you stuff so you can start building your own Azon niche site. That’s also why i won’t be publishing my progress reports very often, just once per month. That should be enough to tell you what I did last month, what I plan for next month and what is my current status like. I will also create a separate page (will be linked in the main menu) where you’ll be able to easily access and find all past progress reports of mine. The first progress report (or however I decide to call it) will be published next month, November 2016. I’ll do my best to write detailed progress reports so you can know what exactly I did and how all that affected my rankings and sales. You will know about all the tools I use on my niche sites, which includes exact themes and plugins used on niche site A and B. The first niche experiment project on AzonHacks has officially started. You know all the main details and soon you’ll learn a lot more. I’ll need your support on this one, so keep your comments coming in regularly. If you want me to include something, like something I could test against my two niche websites write it down in the comments below, it’s not too late for me to accept them (if I like it enough). Make sure to spread the word around about this experiment, tell your friends, share in Facebook groups and let more people know about my little niche duel. And if you wanna be notified about my progress updates make sure to subscribe and join us on Facebook. Great! Interesting journey ahead! I’ld be on the lookout for your email updates. Hey! It’s almost a month now. No updates? I’ll publish it in a couple of days. the experiment will be so much helpful for us.। like this blog so much. will you share both sitess link? Alamgir, no, for obvious reasons I won’t share the exact urls of my niche websites. Maybe at the end of this experiment, I will think about it. Thank you Rifat 🙂 I’m looking for WP themes as we speak, wanna make this live and start publishing content ASAP. Very interested in how this turns out. Keep up the great work and providing us with the tools to reach our goals with affiliate marketing. You and me both Dennis, can’t wait to see first results. Thank you for your support, that’s what keeps me motivated. That’s what I want to learn from you! Can’t wait to see all strategies you put into it. Following your experiment :). One thing that would be really helpful is to let us know that if you purchased a EMD or a partial match domain or other. Yaser, that’s actually an awesome suggestion. I’ll share it with you in more details in my next progress report, but in short, it was a partial match. Sounds interesting. Seems like we are going have some amazing experiment outputs. Just a heads up – If you host both your websites on the same hosting, it might affect you in long run as one website will be completely built on Blackhat SEO techniques. Instead if you host 2 websites on different hosting accounts from same hosting provider, it would be perfect. Am I right? I also made my statement based on all those traditional speculations too. I got your point. Let’s see how actually Google treats websites. Eagerly waiting for your experiment outcomes. Great! Am already glued to this blog…Will subscribe and follow your updates. Thanks for sharing this useful post. Well laid out strategy. I will definitely be on the look out to see how this turns out.